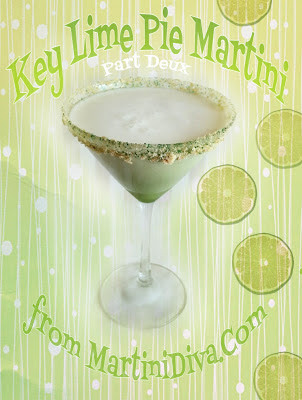 This Key Lime Pie Martini is my own original recipe for one of the most popular designer martinis. I love Key Lime Pie and this is like having a piece served up in a martini glass with the added kick of a little alcohol. I originally did this recipe with real key limes, squeezing great bunches of the special little limes. Wonderful taste but way too much work! So I experimented and discovered that using frozen limeade (do not add water!) worked almost as well with a lot less work! Go ahead and buy a couple of real key limes to use as your garnish if you insist. If you decide to use the key limes instead of limeade you must add more sugar! If you don't have or like rum use vanilla vodka. To get really creative crush up some baked pie shells, mix it with sugar to rim your glass instead of just the sugar. This drink can also be made without the cream for a refreshing Lime Martini.